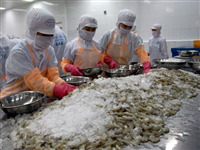 However, shrimp demand of large markets such as the US and Canada decreased due to weather and high inventory volume in Japan, the Republic of Korea and the EU. Domestic prices in the second quarter fell by between 20 and 30 percent, affecting the local market and export value. White-leg shrimp continued to occupy a key position in the market, accounting for 68.7 percent of shrimp exports, while tiger shrimp accounted for 23 percent and other types of shrimp 8.3 percent./.